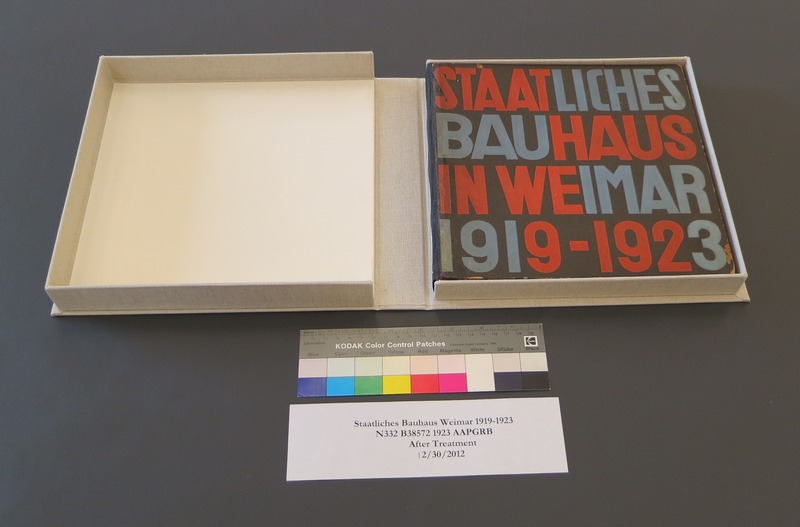 The conservation lab received, from the American Art Museum/National Portrait Gallery Library, a first edition of the first Bauhaus exhibition catalog: Staatliches Bauhaus, Weimar, 1919-1923. 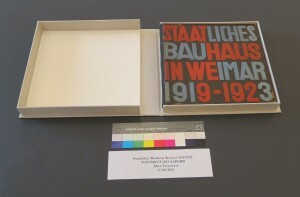 In addition to being a rare copy of this catalog, it is inscribed to the painter Werner Drewes by his Bauhaus teacher, Wassily Kandinsky. 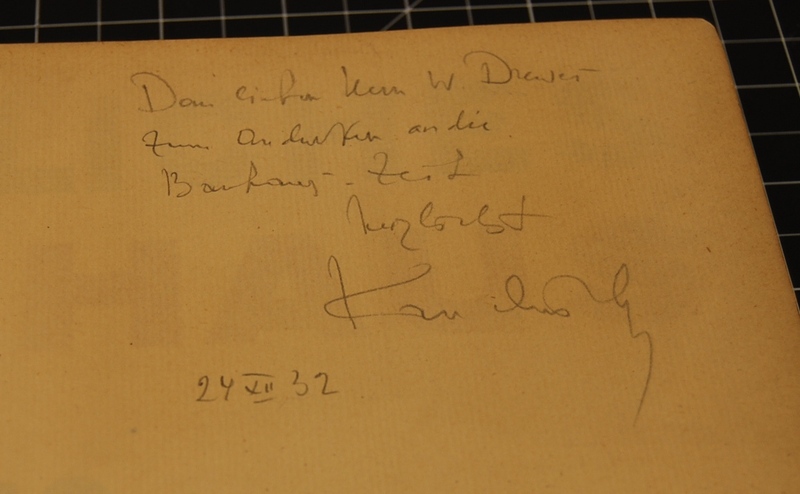 The book was in disrepair with the covers detached. 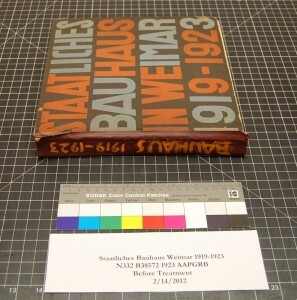 A spine “replacement” fashioned out of a piece of electrical tape had left tape residue on the Herbert Bayer designed cover. Additionally, the paper used for the catalog was highly acidic and discolored and the acidic clay coated plates were chipping. 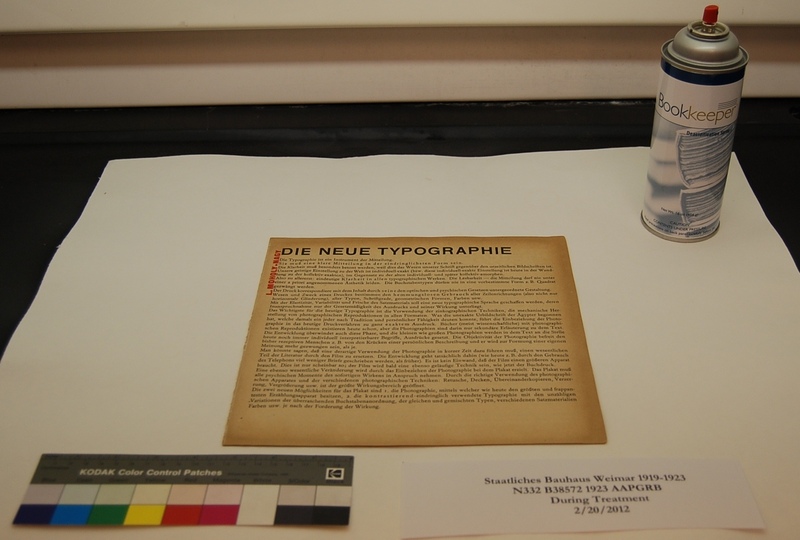 Since portions of the textblock were already detached, the decision was made to dis-bind the textblock completely so that it could be re-sewn. The textblock was also highly acidic so the text pages were treated with Bookkeeper, a spray de-acidification product. Repairs to the damaged plates were made using Japanese paper adhered with wheat starch paste. The now intact and de-acidified pages were then guarded with Japanese paper and re-sewn using the original sewing holes. It’s simply remarkable what people can do with just a little sewing. It can really change a product, no matter what it is. People think of sewing when it comes to fabrics and textiles, but this proves that even paper products and books can be recreated with the proper sewing techniques. It’s great that you can repair and restore these old books. Each one must be individual in the challenges it presents. 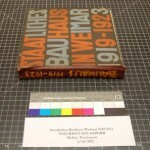 For instance this Bauhaus book had to be re-stitched using the original holes. Now, I’m guessing that this was not done by the traditional saddle stitch machine, more likely by hand? This would require a craftsman to do. Please visit my sewing site.